Unique Hand Marbled Fabrics & Hand Dyed Fabrics for Quilters and Fiber Artists. Different thoughts, ideas, options & inspirations. Think outside the Pattern! I am always looking for patterns to show off my hand made fabrics. 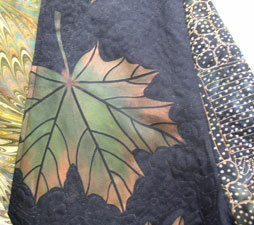 In this case I have mixed my Snow Dyed fabric with some beautiful batiks. I fell in love with Outside the box, because it has a different look, more modern. It’s not hard to assemble, but can be tedious. The instructions are excellent and in color. I can’t wait to see what it looks like quilted. I do believe Spring is here. 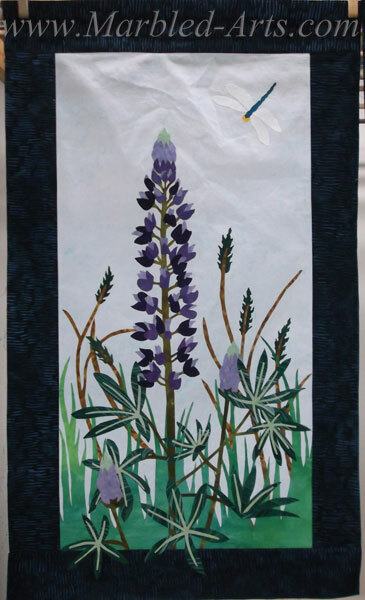 My Lupine is blooming and I will have Fireweed later in the Summer. But right now, I have two gorgeous patterns to show you. 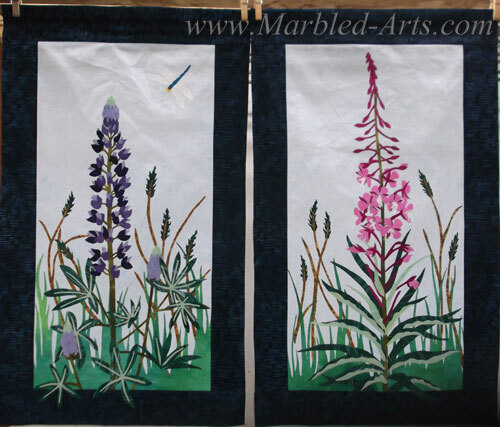 For Lupine I used primarily My Hand Dyed Fabrics. Light, Medium, and Dark Purple for the flower. Light, Medium, Dark Green Hand Dyed and a Dark Green Hand Marbled for the Foliage. Straw color Batiks for the grasses. Scraps of White and Teal Radiance Silk/Cotton for the Dragonfly. Light Blue Patina for the background and Dark Blue Batik for the Boarders. Stay tuned for the quilting. 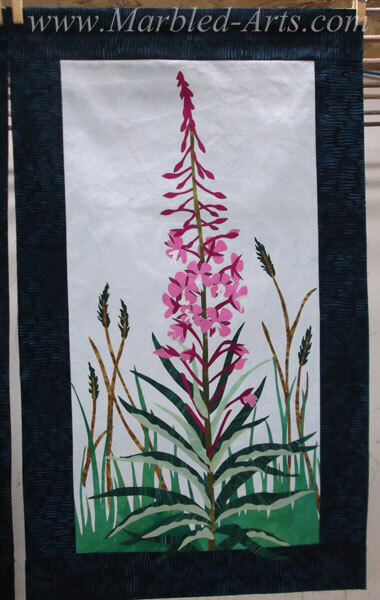 For Fireweed The Background and Foliage is much the same, Light, Medium, Dark Green Hand Dyed Fabric and a Dark Green Hand Marbled for the Foliage. Straw color Batiks for the grasses. Light Blue Patina for the background and Dark Blue Batik for the Boarders. The Fireweed Flower is done using my hand Dyed Pink and Radiance Silk/Cotton in White and Berry. And stay tuned for the quilting. 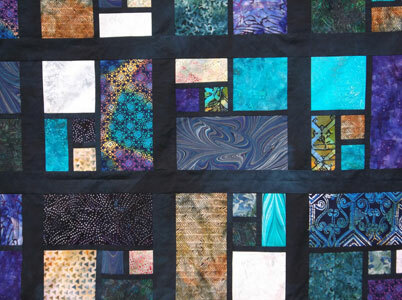 I can’t wait to start quilting. I found a new lighter weight fusible web in the middle of making samples for Lupine and Fireweed. I really love it. Quilting will be the final test. And Yes, I have it on order and will let you know when it arrives. What to do with Snow Dyed Fabric? ” Your fabrics are so beautiful, I just cannot cut it.” I hear that frequently. 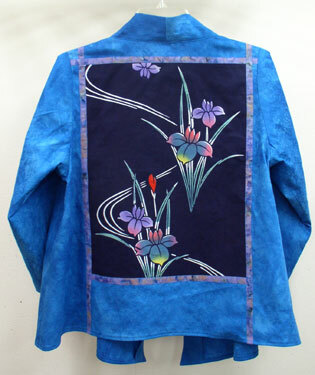 Here is an idea using my Snow Dyed fabric, that just might appeal to you. This wall hanging is based on the Pavers pattern. Instead using a variety of fabrics, we chose to use one gorgeous Snow Dyed Fabric and a rich Hand Dyed Fabric. I say we because, I received an email form my sister Karen that said, “Do you need any samples made? I don’t currently have a project.” I picked out the fabric and turned her loose. I got frequent email updates (she received an ipad for Christmas). I just finished putting on the binding last night. I think I’m in Love! Also check out the quilting. All squares and rectangles. This is how it all started. 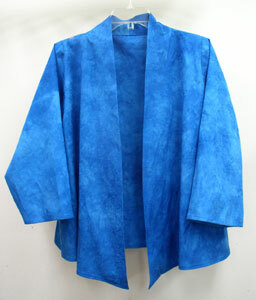 I had been wanting to create the long version of the Kimono Jacket, after all it has pockets and is easy to wear. This button from JJ Handworks was my inspiration. 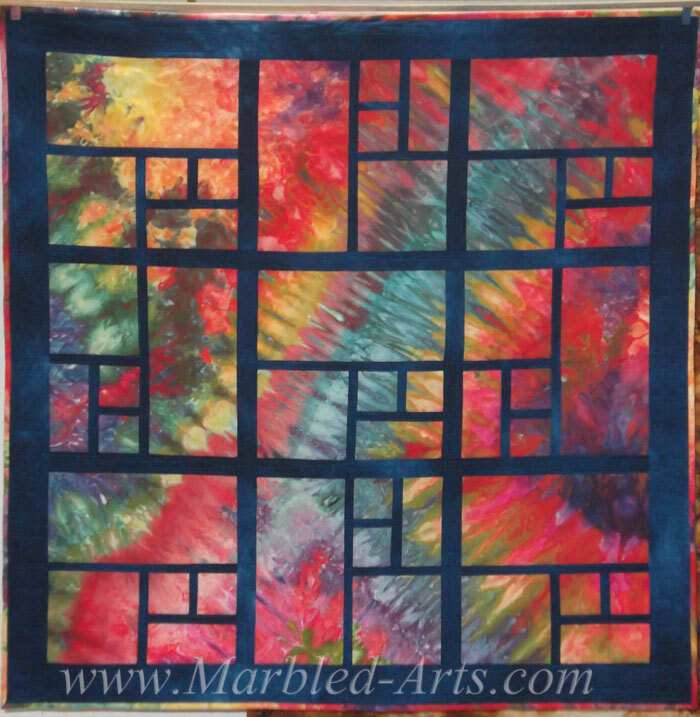 I also wanted to use some to the pieces that I had created using paintstiks on hand dyed fabric combined with hand marbled fabric and a beautiful batik. 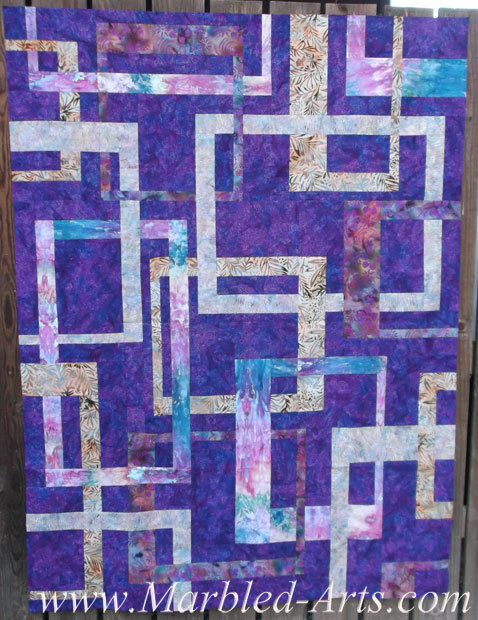 I wanted to experiment with different styles of fill in Free Motion Machine Quilting and thread. So each section is a bit different design and thread. I have fallen in love with Wonderfil Thread. This was a wonderful way to get to know some of their different threads and I had a great time playing with thread. I will confess that the Left side (the black with all the falling leaves) is not the original panel. I did one using thread and I was just not happy with the way it turn out. 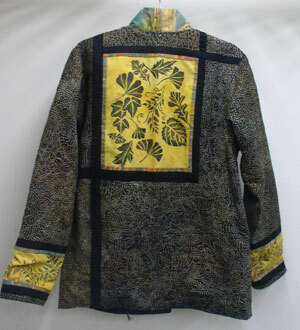 By that time I no longer had any more of the original batik. I know me and if I don’t love my wearable pieces I won’t wear them. So the jacket was on hold until inspiration hit. I’m part of a Art Quilt group and one day we were playing with paintstiks and this idea just sort of fell together and Im so happy with the way Kimono Leaves turned out. It was worth all of the time and energy. 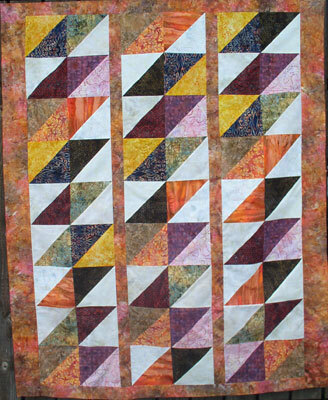 Batik Diamonds is my most current pattern sample. This top takes 14 Fat Quarters, 7 dark and 7 light. 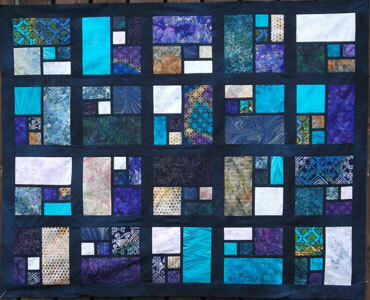 I worked on it two afternoons to finish piecing. It will be traveling with me, then it will get quilted. 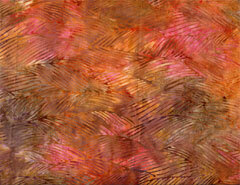 It all started with the Pumpkin Wings Batik, a multi colored batik. I then went thru my fabrics and pulled out some that had one or more of the many colors in it. I wanted bright, happy, sunny colors and yes it makes me smile. My neice just recently had her first child. 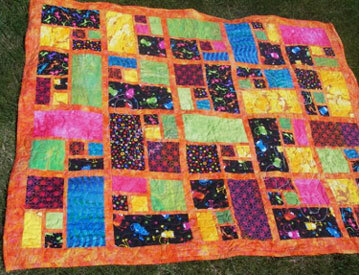 This is a quilt Grandma made for Maddison. As you can see much of the fabric is from me. 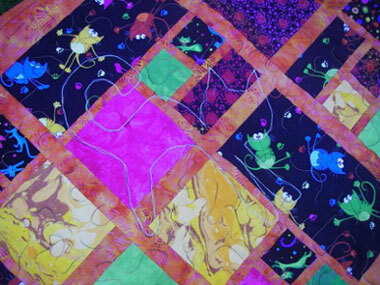 It all started with the cat fabrics, some really bright cats in various jewel tones. And it just grew from there. Our family is of the notion that bright colors are for babies, no pastels allowed. Bright orange, blue, lime green, pink, yellow, red, purple. The back is Hand dyed lime green Flannel. I love the quilting with the big outlines of cats. It was fun to be able to help choose the fabric and now to see the final project completed. Well the photos for now, the quilt and Maddison soon. My latest creation was really just for fun, well and possibly to wear to a fancy wedding later in the Summer. 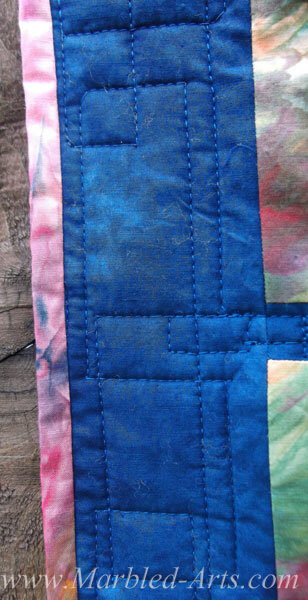 I hand dyed some PFD Jacquard a beautiful Cerulean Blue. 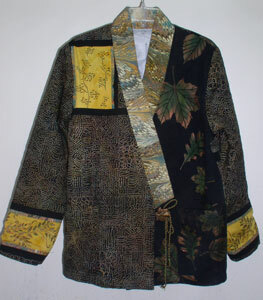 The panel on the back is a piece from an antique kimono that I found in my wanderings. I outlined it with a Lilac Patina batik. I used a 1/2″ bias tape maker to make the outline strips. It is all very simple but elegant and suits me just fine. And Yes, you can find A little Somethin’ the pattern, the PFD Rose Damask Jacquard and the batik all on my website www.marbled-arts.com.